Razor Energy initiated a dividend in October 2018, just before the sudden drop in Canadian oil prices. Besides the unfortunate timing, the dividend is a bad idea for three reasons: high debt, high costs, and low valuation. With a WTI price currently above US$63/bbl, the dividend is safe, though. At the beginning of October 2018, Razor Energy (OTC:RZREF) initiated a dividend. The monthly dividend of C$0.0125 represents an annual cash outflow of approximately C$2.3 million. With the stock price at C$2.7, the 5.56% dividend yield is attractive. But the timing of the announcement of a dividend at the end of Q3 couldn't be worse. Oil prices at the Edmonton hub dropped 43% during Q4 compared to the previous quarter. Since the beginning of the year, oil prices have recovered. But, beyond the unfortunate timing, I don't like the decision to pay a dividend for three reasons. Instead of paying a dividend, I'd prefer the company to focus on reducing the net debt. At the end of Q4, the net debt increased to C$54.2 million compared to C$24.4 million last year. The net debt to TTM adjusted funds flow ratio is high at 2.65x. Besides, the cost of debt is important. The non-revolving term loan of C$45 million constitutes the biggest part of the net debt and bears an annual interest rate of 10%. Also, the term loan expires in less than 2 years, in January 2021. In the context of depressed Canadian oil prices during Q4, the company breached a working capital financial covenant. AIMCo, the lender, which also owns approximately 14% of the outstanding shares, agreed on a waiver. But this event highlights the need to manage the net debt in a prudent way. Until the term loan expires, the company will have paid about C$5.4 million for the dividend. I would have preferred the company to reduce the net debt to get better conditions when renegotiating the debt. Growing production instead of paying a dividend would reduce per-unit costs. The table below compares Razor Energy's per-unit costs with two other Canadian oil producers: Crescent Point (CPG) and Whitecap Resources (OTCPK:SPGYF). The comparisons aren't perfect as the production mixes aren't identical and the producers aren't exposed to the same benchmark prices. 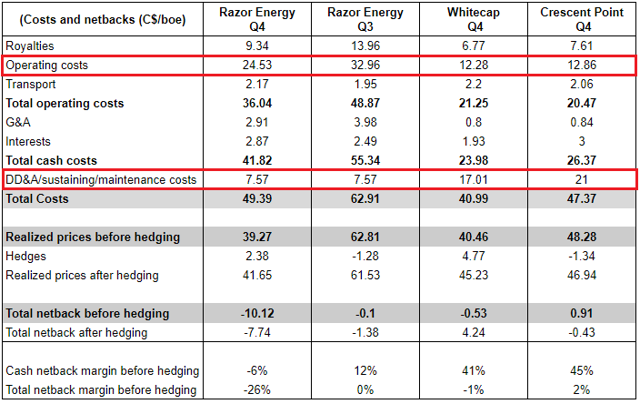 But the point is to highlight Razor Energy's higher total costs despite the low sustaining costs. Razor Energy produced 4,888 boe/d in 2018 while Crescent Point and Whitecap produced 178,166 boe/d and 74,415 boe/d, respectively. Razor Energy's smaller scale isn't the only reason for its higher per-unit costs and management is taking initiatives to lower operating costs. But, instead of paying a dividend, I would have preferred the company to grow production to lower the per-unit operating and G&A costs. At an important discount to the fair value estimate of intrinsic value, repurchasing shares is a better capital allocation decision than a dividend. And based on guidance, such a discount exists. The table below summarizes the outlook for 2019. Assuming a WTI price of US$55/bbl, management expects to reduce the net debt while holding production flat and paying the dividend. It means the company will generate a free cash flow of about C$5.4 million (C$3.1 million of net debt reduction with the C$2.3 million dividend), which is equivalent to a free cash flow of C$3.02/boe. 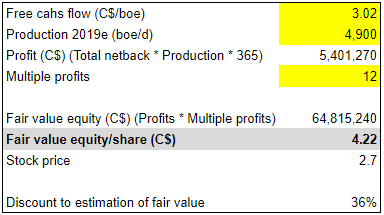 As usual, to estimate the intrinsic value, I apply a 12x multiple to the free cash flow that corresponds to a flat production. The stock price at C$2.7 represents a 36% discount to this fair value estimate based on management's forecasts. Considering the discount to the estimated intrinsic value, repurchasing shares instead of paying a dividend would provide more long-term value to the shareholders. The flowing barrel valuation also shows the company isn't expensive if management delivers as forecasted. Razor Energy's higher costs and lower netbacks justify the lower flowing barrel valuation at C$19,534/boe/d, though. For the same reason, the market values the Razor Energy's reserves at a discount compared to the two other producers. Also, the market values the company at a 55.8% discount to the PDP NAV of C$6.11/share. Comparing the PDP NAV to the stock price must be carefully considered, though. The PDP NAV dropped 36% compared to last year because of the higher debt. Also, the NAV is based on optimistic oil prices assumptions and doesn't take into account the G&A costs. You can have more prudent assumptions. But if management is confident in its outlook, the discount to fair value is obvious. Repurchasing shares would provide more value to the shareholders. Many investors welcome a dividend as a return to shareholders. The company was unlucky announcing a dividend just before the sudden drop in Canadian oil prices at the end of 2018. But I criticize the decision to pay a dividend for more fundamental reasons. First, the high leverage at a high cost is risky. With only one quarter of depressed Canadian prices, the company breached a covenant. Second, the costs are high and the company needs to grow production to reduce the per-unit costs. Third, considering the 2019 outlook and the stock price, repurchasing shares would provide more value to shareholders. With WTI prices currently above the 2019 outlook's assumptions, the dividend is safe, but it's not the best capital allocation decision. And, considering the important debt and the high costs, if WTI oil prices drop again below US$55/bbl, the dividend isn't sustainable. Disclosure: I am/we are long CPG. I wrote this article myself, and it expresses my own opinions. I am not receiving compensation for it (other than from Seeking Alpha). I have no business relationship with any company whose stock is mentioned in this article.